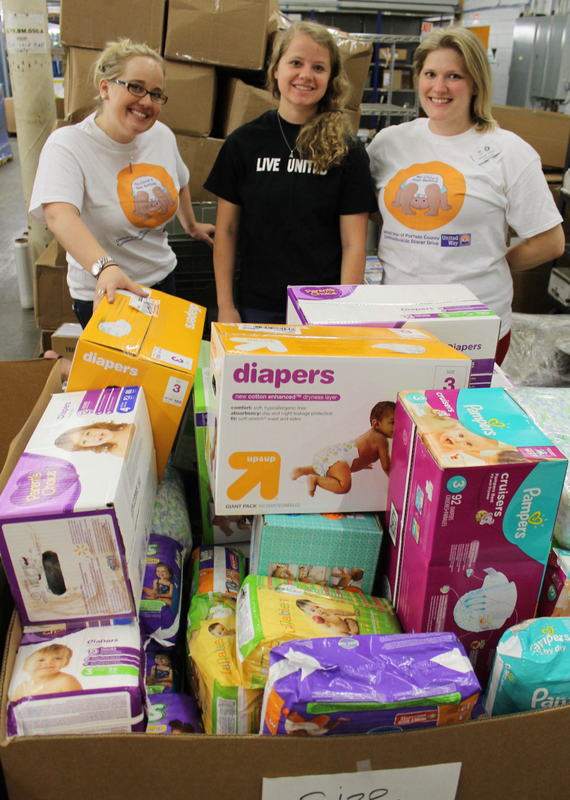 More than $12,000 in diapers and monetary donations were collected during last year’s drive, filling a need many local agencies said was a top issue facing struggling families. Many local individuals, businesses, and churches, participated in the diaper drive throughout the month-long effort, said Cecily Mileski, United Way of Portage County Community Services Manager. The donation total includes donations from Okray Foundation, Sentry Cares, AIG, Associated Bank, Good Shepherd Lutheran Church, and community members. For the fifth consecutive year, NAPA Distribution acted as the major collection site during the wrap-up of the drive. Mileski said since its inception in 2013, the diaper drive has been filling a need many local agencies identified as a top issue facing struggling families, which can often result in health issues for infants and toddlers whose diapers are not changed as frequently as they should. 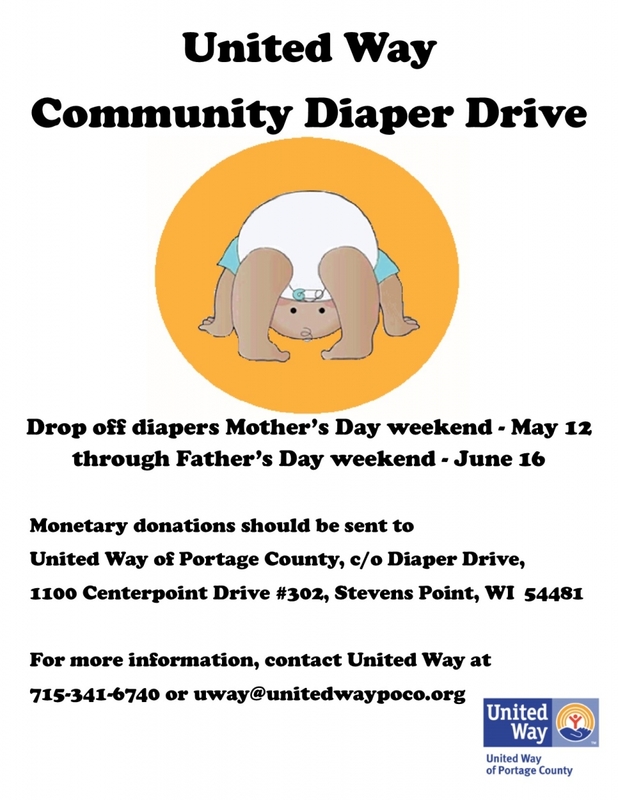 Monetary donations can still be dropped off at or sent to United Way of Portage County, c/o Community Diaper Drive, 1100 Centerpoint Dr., #302, Stevens Point, WI 54481. Requests for diapers should be made through Emergency Services. The primary source for distribution of diapers will be Operation Bootstrap. Emergency and holiday distribution will be provided through other programs serving income-qualified families. According to local agencies providing basic needs, diapers were felt to be one of the top issues facing local struggling families. According to the National Center for Children in Poverty, 22% of all children live in families with incomes below the federal poverty level. The percentage of Portage County individuals below the poverty level in 2013 was 13.7%, up from 11.6% in 2010, with 6,549 households with an income below $24,999. Of the 70,019 residents, 4,498 are under six years of age. Many Portage County licensed child care centers do not accept cloth diapers and require parents to provide a steady supply of disposable diapers. Many laundromats do not allow customers to wash cloth diapers, for sanitary reasons. Infrequent diaper changes increases the risks of illness and infection. A lack of diapers can jeopardize a family's ability to remain economically stable, as well as their child's health. The likelihood of abuse increases when a baby is in a household facing the stresses of poverty, and increases even more when that baby is crying due to the discomfort of a soiled diaper and the health issues that can result. Parents can become disheartened and disconnected when they struggle to care for their babies. Diapers cannot be purchased with food stamps or WIC. Infants need up to 12 diapers each day and toddlers need up to 8 diapers each day. On average, a diaper costs 31 cents. An adequate monthly supply of diaper costs $100/month or more per child. According to babycenter.com, the average cost of disposable diapers and wipes per year for one child is $1,104. Parents without transportation to a grocery store or "big box" discount store must rely on convenience stores, where disposable diapers and diapering supplies can cost $120 per child per month (or some $1,440 per year). When a parent works 40 hours a week and is paid the federally-required minimum wage of $7.25 per hour, the bill for diapers is nearly ten percent of their gross salary. How will diapers be distributed? United Way's primary source for distribution is Operation Bootstrap. Emergency and holiday distribution will be provided through other programs serving income-qualified families. Organizations will follow a tracking system and each family they will distribute to will meet established criteria. Requests for diapers will be made through Emergency Services. Criteria for distribution for diapers will remain quarterly.